Thousands of Cardinals and other baseball fans take MetroLink and MetroBus to Busch Stadium every season so the St. Louis Cardinals are offering special ticket discounts to public transit customers and Metro employees. 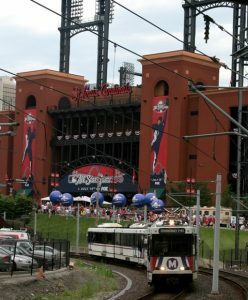 Metro customers and employees can now buy discounted Cardinals tickets for the home games this week, the June 23 game, and select dates in July, August and September this season. The coupon code is valid for 28 games from tomorrow night through September 25. Notable upcoming games include Stan Musial Poster Night on June 6 and Replica 2011 World Series Game 7 Ticket Night on June 23.